With the new touch screen, HettCube incubators and cooled incubators guarantee intuitive operation with flexible and individual setting options and many new features. The proven combination of natural and forced convection ensures stable and homogeneous temperatures in a much larger part of the interior than conventional incubators. This offers you up to 30% more validated useful space with the same interior space. In addition, the high design of the HettCube incubators requires up to 50% less floor space with comparable capacity. HettCube incubators combine the advantages of natural and forced convection. The fan is housed outside the usable space, so that there is a low air flow inside the incubator. Temperature is maintained by radiated heat, preventing the formation of hot spots. Most incubators lose up to 10% their “useable” internal volume after validation. HettCube incubators due to their gentle air flow and edge-to-edge temperature uniformity provide up to 30 % more validated usable space in accordance with DIN 12880:2007-05 than a traditional incubator with the same internal volume. The HettCube’s upright design requires up to 50 % less floor space than a traditional incubator with similar capacity. The spacesaving footprint allows you to nearly double your capacity by accommodating two HettCube incubators within the same footprint as one conventional incubator. HettCube design features make for an uncomplicated, trouble free user experience. The internal lining, drawers and shelves are made of stainless steel and can be readily removed for thorough cleaning and autoclaving. Get higher loading capacities in less space by using the special inserts. Our rack for Petri dishes and the Loewenstein shelf, allows large numbers of cultures to be processed quickly and economically. They provide more space, clear order and a comfortable handling. The door does not require space at the side to open. This means that the incubator can be positioned in a corner or close to other lab equipment. The door hinges can easily be moved from one side of the incubator to the other. One bushing on the rear panel (42 mm opening) for independent measurements and external devices. HettCubes need only one door and do not require an inner door. This allows a true one-hand operation. A HettCube incubator will close automatically at an opening angle below 90°. A magnetic mechanism assists this automatic closing. The practical door-locking mechanism locks both the door and the control panel at the same time. This prevents inadvertent changes to parameters and harmful effects on samples. Our incubators are quieter than normal conversation when running, and will not increase the noise levels within your lab. A HettCube incubator has a remarkably low noise output of ≤ 44 dB(A). The HettCube 400 and 600 models have heavy-duty castors for moving them to the desired position. Once in position they can be fixed with adjustable feet. The stable telescopic rails of the Hettich Tray System (HTS) can be extended up to 70% horizontally. This allows you to reach easily the samples in every corner. Temperature flucuations are actively and immediately compensated for. HettCube with glass door condensation diagram. HettCube incuabtors are safe for the ennvironment both inside and out. 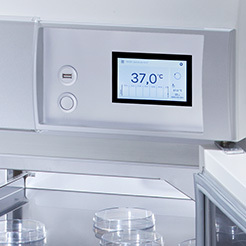 At an operating temperature of 37 °C a HettCube incubator consumes less than 0.05 kWh. With an advanced control system and water-driven foam insulation, HettCubes will maintain a constant set temperature even if there is a difference of only 1K from ambient. HettCubes comply with all relevant safety and regulatory standards and come with a HettCert factory ceritifcate. See our complete line of HettCube incubator accesories and optional equipment. Below are resources to help you get famiiar with HettCube line of incubators.